Working with students is so inspiring. Just the way they look at the world with their young eyes challenges my own way of thinking. This is why it is so important for us to start reading to our children from the moment they are born. Reading expands a child’s world exponentially each and every time we open a book with a child on our lap. Each and every one of our young people have such incredible potential to learn. But it is hard to learn if we can’t read. We used to think of literacy as just our ability to read, but today literacy encompasses technological skills, as well as knowledge of health and personal finances but the foundation to all literacy is the ability to read. Our job as teacher librarians is to match readers to books that will inspire them to want to read more and more. Learning to read is hard work and no one is going to succeed in reading unless they are interested in what they are reading. Reading fluency depends on our ability to inspire students to want to read because it is only with practice that we become fluent readers and writers. Stop for a minute and imagine what it might be like to not be able to read! A person who can’t read is unable to be independent, unable to help themselves and their families. Not only are there incredibly debilitating consequences for illiterate individuals but there are enormous negative consequences for our communities, both local and international. We need to make a commitment to literacy by creating community partnerships between school librarians and public librarians, government and community leaders need to provide support community partnerships with sustainable funding models but mostly we all need to think a little bit out of the box and make it happen! We are all depending on it! The focus of Rebecca’s article is communicating with patrons and maintaining transparency in all our actions. As custodians of public property it is incumbent on us to educate the public by explaining why and how we select and de-select library materials. We need to invite our stakeholders to ask questions, voice concerns and weigh in on our Collection Development Policies in order to help determine what should or should not be kept in the collection. Thank you, Rebecca for so eloquently stating the case for weeding and the importance of educating the public. It is,after all, their public library. Your one-stop shop for blog posts across the Library about books, reading and literature. Eliminate all barriers to access for all. So glad this article was published. I have worked in several libraries that do not charge overdue fines but instead have had a conscious jar on the counter, so that if a patron wants to make a small donation they can. This money really adds up and because of the nature of the donation the revenue is added to the library donations fund. Some think this is just a sneaky way to take the fine money from the town general fund but it really is more about not taking punitive measures against patrons. The same goes for other fines such as lost library cards. One library I worked in charged $5 for a lost card when the card really only cost the library less than .50! For many people $5 is a lot of money, so what are we going to do? Prohibit them from using the library? If you have to have fines and fees then charge a minimal amount. I think most people return books on time and by not charging fees we can remind them that libraries in fact rely on the good of the community to serve the community. Then we can always suggest someone can make a donation if it makes them feel better about keeping a book past due. School librarians or Library Media Specialists are one of the few people who work with every single student in the school. They are one of the few people who can support all teachers and students in all subject areas. Despite evidence that shows the positive impact school library media specialists have on student learning there are too many schools who have to operate without the benefits of having a librarian on staff. Cutting back on school library media specialist positions in our schools is short sited. School library media specialists are trained professionals who have the skills necessary to evaluate and update collections to support school curriculum. School library media specialists have a deep understanding of literary genres to assist students in choosing books to read for pleasure while continuing to challenge reading and comprehension skills. School library media specialists are expert researchers who can curate information sources to meet the specific needs of teachers and students. School library media specialists teach research skills, digital citizenship, online safety and multimedia communication skills. School library media specialists provide professional development opportunities to teachers in the areas of digital citizenship, research and copyright issues. In order for school media librarians to have the most impact on student achievement school leaders need to make a commitment to providing opportunities for library media specialists to collaborate with classroom teachers. For more information on how School Library Media Specialists make a positive impact on our learning communities check out the following articles. Customer service. My very first job as a teen was in the office of a family owned department store. The office may as well been called the returns center. It was here that I learned that the Customer is indeed Always Right! We would take back anything! — used lipstick (wrong color) or half eaten loaves of bread. I never ceased to be amazed. Back then there were not so many choices of where to shop. This store was an outlier, and made that extra effort to lure consumers from the more conveniently located brand name grocery chains etc…. They had many loyal customers AND many loyal employees. The key to employees adopting the customer is always right motto was that we (the employees) were supported and treated with respect. The employees were always right as well. We were never expected to put up with any sort of abuse. If there was any difficulty with a customer, there was always a co-worker or supervisor there to back you up. It was clear that we were a team and while we really did strive to please the customer it wasn’t at the expense of our own integrity. 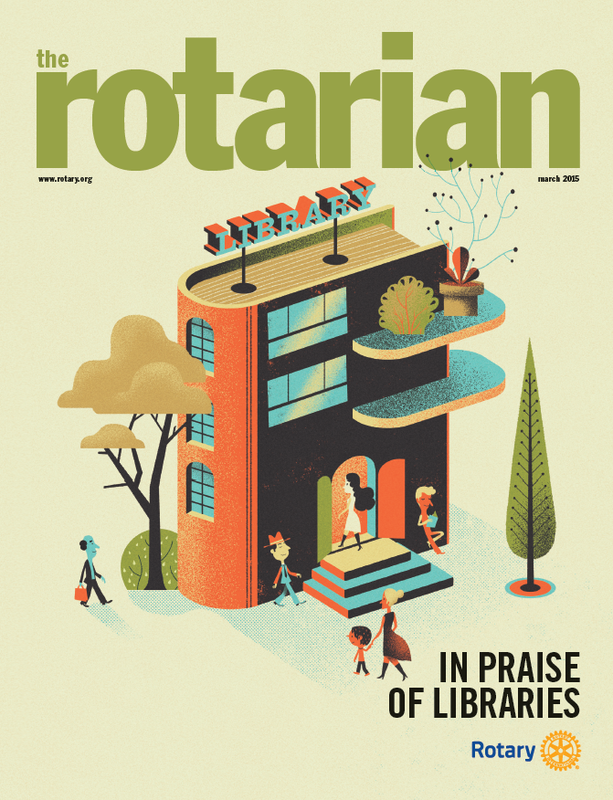 Thanks to Lina Hoelzel from the Dudley Tucker Library in Raymond NH for sharing the March 2015 issue of The Rotarian! The cover article “In Praise of Libraries” by Joe Queenan is one more example of how essential public libraries are. As a librarian, I certainly don’t need to be convinced but I will save this article to share with others because I am sure his sentiments mirror many of their own. For the past two weeks my K-4 students have been making bookmarks for the Students Rebuild Literacy Challenge. Although the challenge was launched on International Literacy Day, I heard that the Bezos foundation would double their already generous donation of $1 for each bookmark that was postmarked by Feb. 14th. Well, you do the math! So we got to work. The students never cease to amaze me with their generosity of spirit and artistic talents. The students were amaze d when I told them that over 200 million children just like them couldn’t read. We tried to imagine what that might be like by putting ourselves in another country where we don’t understand the language. One student pointed out that there are universal symbols. Yes! But we all agreed that not being able to read details and important information could be scary. Another student succinctly put it: “If you cant read you can’t understand anything.” We talked about how lucky we are that we could read. We can read because we can practice with books that are interesting to us. That is why it is so important that the “funds generated by the program will help Save the Children’s Literacy Boost program add a greater variety and complexity of reading materials to their international book banks and improve outcomes including school attendance, reading comprehension and self-confidence.” Readers are Leaders! Ursula Le Guin! Listen Carefully. What an inspiration!